Japan’s main islands of Honshu, Kyushu and Hokkaido are served by a network of high speed train lines that connect Tokyo with most of the country’s major cities. Japan’s high speed trains (bullet trains) are called shinkansen (新幹線) and are operated by Japan Railways (JR). The shinkansen network consists of multiple lines, among which the Tokaido Shinkansen (Tokyo – Nagoya – Kyoto – Osaka) is the oldest and most popular. All shinkansen lines (except the Akita and Yamagata Shinkansen) run on tracks that are exclusively built for and used by shinkansen trains. Most lines are served by multiple train categories, ranging from the fastest category that stops only at major stations to the slowest category that stops at every station along the way. 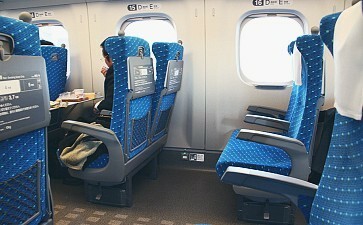 Like the name suggests, ordinary seats are the regular seats found on all shinkansen trains. Although the size and foot space of ordinary seats varies between train sets, ordinary seats on shinkansen are generally comfortable and offer a generous amount of foot space. They usually come in rows of 3×2 seats. Comparable to business class on airplanes, green cars offer seats that are larger and more comfortable than ordinary seats and offer more foot space. 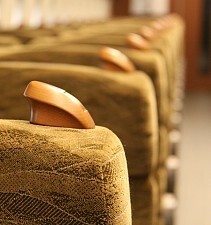 The seats are arranged in rows of 2×2 seats. Green Cars tend to be less crowded than ordinary cars. Furthermore, Gran Class is available on new train sets along the Tohoku Shinkansen, Hokuriku Shinkansen and Hokkaido Shinkansen. Comparable to first class on airplanes, Gran Class offers seats that are even more spacious and comfortable than Green Car seats (in rows of 2×1 seats) and additional amenities and services. 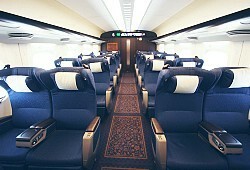 Most shinkansen trains offer both non-reserved seats (自由席, jiyūseki) and reserved seats (指定席, shiteiseki) in separate cars. Only the Hayabusa, Hayate and Komachi trains on the Tohoku Shinkansenand Hokkaido Shinkansen and the Kagayaki trains on the Hokuriku Shinkansen are fully reserved and do not carry non-reserved seating. All seats in Green Cars are reserved. 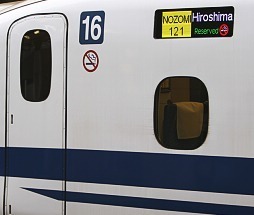 Bilingual signs indicate whether a shinkansen car carries reserved or non-reserved seats. Advance seat reservations are required to use a seat in a reserved car (see below on how to make seat reservations). A fee of a few hundred yen applies for making seat reservations. 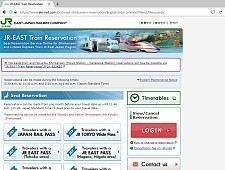 Japan Rail Pass holders can make seat reservations for free. The fare to be paid to get from A to B. Increases step wise according to the distance traveled. 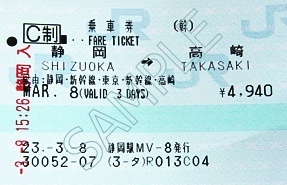 Issued as a base fare ticket (乗車券, jōshaken). The supplement fee to be paid for using a shinkansen train (as opposed to a local train). The fee increases step wise according to the distance traveled. 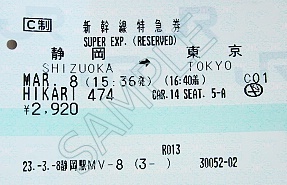 The express supplement is issued as a limited express fee ticket (特急券, tokkyūken). 320, 520 or 720 yen depending on whether it is low season, regular season or high season respectively. An additional supplement (100-620 yen depending on distance traveled) applies for using reserved seats on Nozomi, Mizuho, Hayabusa and Komachi trains. The seat reservation fee is usually combined with the express supplement into a single ticket. The supplement fee for riding the green car. Increases step wise according to the distance traveled. It is usually combined with the express supplement into a single ticket. A passenger typically receives two pieces of tickets (a base fare ticket and a supplement ticket), although in some situations the two tickets are combined into a single ticket. If multiple trains are involved, there can be more than two tickets (one supplement ticket for each train). Starting on September 30, 2017, it became possible to use IC cards, including Suica, Pasmo and Icoca, on the Tokaido–Sanyo Shinkansen. In order to do so, the IC card has to be registered at a dedicated website (an English app will be released on October 30) alongside a credit card. Afterwards, it is necessary to purchase a shinkansen ticket online before being able to pass through the shinkansen ticket gates with your registered IC card. Fares are discounted by 200 yen when using this service and are charged to the registered credit card rather than subtracted from the IC card’s balance. On all other shinkansen lines (except the Kyushu Shinkansen), the “Mobile Suica” app can be used on mobile phones to ride the shinkansen; however, the app is only available in Japanese and on phones that support the Osaifu Keitai functionality. The Japan Rail Pass can be used on all shinkansen trains except Nozomi and Mizuho trains and covers all the fees involved. Seat reservations can be made for free at ticket counters. Pass holders will receive a seat reservation ticket that indicates the reserved seat. They need no tickets besides their rail pass when using non-reserved seats. Similar to the nationwide Japan Rail Pass, there are numerous regional passes that also cover some shinkansen trains. Small discounts are available for set ticket (回数券, kaisūken) and round trip tickets (往復割引, ōfukuwaribiki) that are available for selected sections. Other tickets provide a discount when purchased in advance (早得, hayatoku). Discount ticket shops around major stations also sell shinkansen tickets at small discounts. Travel packages such as the various shinkansen tour packages by Japanican or the Puratto Kodama Economy Plan (for travel along the Tokaido Shinkansen by Kodama) can provide more substantial savings, but have to be purchased in advance. Seat reservations allow you to secure a seat and travel with peace of mind. 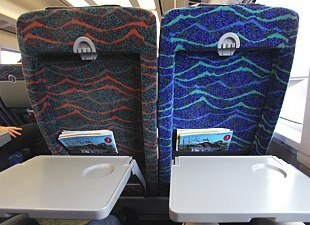 They can be made for all shinkansen trains, but are not mandatory on the trains that also carry non-reserved seating. Only the Hayabusa, Hayate and Komachi trains along the Tohoku Shinkansen and Hokkaido Shinkansen, and the Kagayaki trains along the Hokuriku Shinkansen require seat reservations. When and where can I make seat reservations? 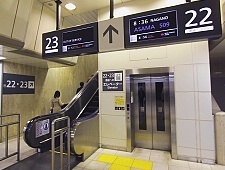 Seat reservations can be made in person at ticket offices of all major JR stations across Japan. Any shinkansen can be reserved from any JR ticket office in Japan. A few types of vending machines with bilingual menus (Japanese and English) allow travelers to make seat reservations on shinkansen trains. Japan Rail Pass holders cannot use vending machines to make seat reservations. JR East operates an English website that allows regular travelers and rail pass holders to book tickets and make seat reservations for selected trains in Eastern Japan and Hokkaido. Furthermore, an English app was released on October 30, 2017 to users in the United States, Singapore, Australia and Hong Kong for purchasing tickets for the Tokaido–Sanyo Shinkansen (the app cannot be used by pass holders for making seat reservations, though). Japanese websites for online reservations are operated by the JR companies, but require Japanese language skills. What information is needed to make a seat reservation? If you do not speak Japanese, it is recommended that you write the data on a piece of paper and present it to the salesperson in order to make the purchasing process smoother. Salespersons are generally familiar with the English vocabulary needed for the purchase of train tickets and seat reservations, but many have limited English conversation skills. 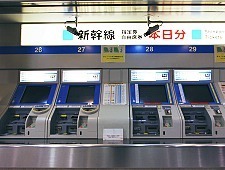 Cash and credit cards can be used at ticket counters and vending machines that sell shinkansen tickets. 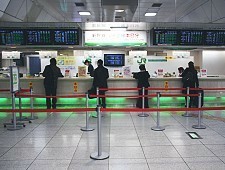 At some ticket counters, you should indicate at the beginning of your order that you will be paying by credit card. Japan Rail Pass holders can make seat reservations for free. On many trains reserved seats do not get booked out, but on some they do. On particularly busy travel days (e.g. peak travel days during Golden Week, Obon and the New Year holidays), trains can get booked out several days in advance, but on most other days trains rarely get booked out more than a few hours in advance, if at all. For peace of mind seat reservations are always recommended, especially when traveling in groups and preferring to sit together. On a few shinkansen trains along the Tohoku Shinkansen, Hokkaido Shinkansen and Hokuriku Shinkansen seat reservations are mandatory. How to use the shinkansen? 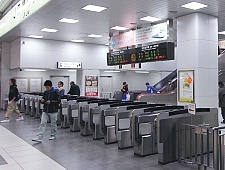 At many stations, shinkansen passengers have to pass through two sets of automatic ticket gates: regular ticket gates and shinkansen ticket gates. At the regular ticket gates, insert only your base fare ticket into the ticket slot, pass the gate and retrieve your ticket at the other end. 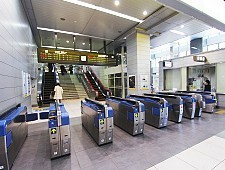 Japan Rail Pass holders cannot use the automatic gates, but have to show their pass to the staff at the manned gate. 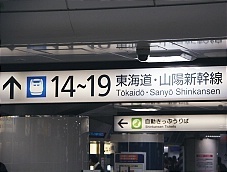 Follow the bilingual signs to the shinkansen platforms. Depending on the station, the shinkansen platforms are sometimes placed parallel to and close to the regular train platforms, but often they are located in a separate part or on a different level of the station complex. A second set of gates divides shinkansen platforms from the regular train platforms, although at some stations there are also direct gates to the shinkansen platforms that allow passengers to skip the regular gates. This time, insert not only your base fare ticket but also your supplement ticket together into the ticket slot at the same time and retrieve them on the other side of the gate. Japan Rail Pass holders again use the manned gate, instead. Displays of upcoming departures will indicate from which platform your train will depart, while signs clearly indicate the way to each platform. Virtually all shinkansen platforms are equipped with escalators and elevators. Displays on the platform indicate upcoming departures. 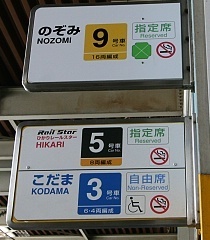 Other displays and/or signs mark the location of doors, indicating car numbers and whether the car is reserved, non-reserved or green. Some busy stations have two lanes painted on the platform in front of each door location: one for the upcoming departure and one for the departure afterwards. Passengers line up accordingly, especially in case of non-reserved cars to secure seats. Seats are numbered and lettered in the same style as on airplanes. Try not to block the aisle when storing your luggage and taking your seat to allow for quick boarding. 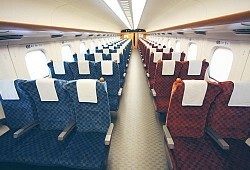 Ordinary seats typically come in rows of 3×2 seats, although on some trains they are arranged in rows of 2×2 seats (and in rare cases in rows of 3×3 seats). Seats can be reclined and have tables, pockets for magazines and open overhead shelves. They provide considerably more foot space than economy seats on airplanes. Some newer train sets have electrical outlets installed along the walls. Green cars always come with rows of 2×2 seats and have seats that are more spacious than ordinary seats. 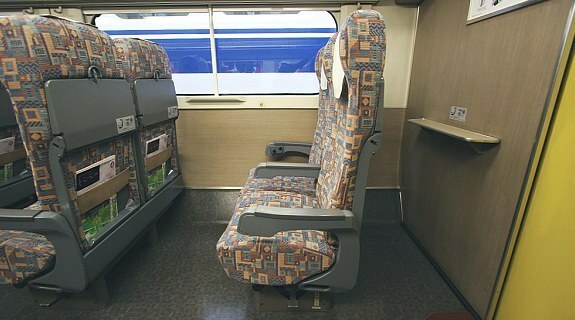 The seats are often equipped with a foot rest, reading light, electrical outlets (for aisle and window seats) and a seat warmer, although the exact facilities depend on the train set. 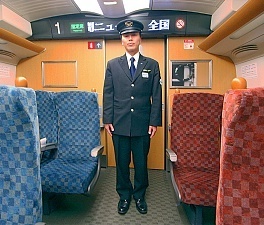 All seats on shinkansen trains can be turned by 180 degrees, allowing travelers to always face forward. The seats are turned by the staff at the terminal stations, but can also be turned by passengers, for example, to create a group of four or six seats facing each other. Signs and announcements inside the trains are multilingual (Japanese and English on all shinkansen lines; plus Korean and Chinese on selected lines) and inform about upcoming stations. Most shinkansen trains are served by small food carts with a selection of snacks, drinks and boxed meals (bento) which periodically pass along the aisle. Some trains also have vending machines with drinks and pay phones. 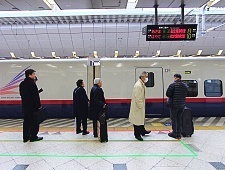 Wireless internet is available on the newest train sets between Tokyo and Shin-Osaka, however, a subscription or 1-day pass has to be purchased before boarding the train. All shinkansen are equipped with multiple toilets, which are sometimes separated by gender. The toilets are Western style except on some older train sets. Newer train sets are also equipped with spacious toilets for wheel chair users. Outside the toilets are wash corners with sinks and large mirrors. 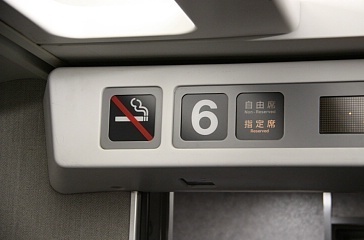 Smoking is not allowed on most shinkansen trains. Prominent exception is the Tokaido/SanyoShinkansen on which some last smoking cars survive on older train sets. 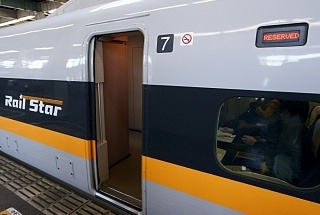 On newer train sets along the Tokaido/Sanyo Shinkansen, smoking is allowed only in small cabins with good ventilation that keep the trains free of smoke. On all other shinkansen lines, smoking is not possible. 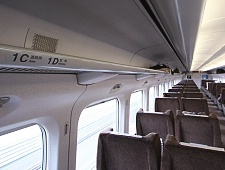 Shinkansen trains are equipped with relatively spacious overhead shelves (smaller on certain train sets) which can store small and medium sized bags and suitcases. Additionally, there is usually space for two or three large suitcases behind the last row of seats in each car. On many shinkansen trains the leg room is large enough to place a suitcase in front of you, although this may not be the most comfortable solution. According to the rules book, each traveler is allowed to bring up to two pieces of luggage onto a train (not including small bags), with each piece not weighting more than 30 kilograms and not measuring more than 250 centimeters when adding up width, height and depth. However, even when bringing less than this upper limit, we recommend travelers with a lot of luggage to consider using a delivery serviceto make the trip more comfortable for themselves and the passengers around them. Don’t block the aisle with luggage. When having a conversation, keep your voice down. Recline your seat with consideration for the person behind you. Return the seat to its original position before exiting the train. Set your mobile phone to silent mode. Don’t talk on your phone except in the deck areas between cars. Line up on the platform before boarding. Hokkaido Shinkansen: extension from Hakodate via Niseko and Otaru to Sapporo in 2030. Hokuriku Shinkansen: extension from Kanazawa to Tsuruga in 2022 and via Obama and Kyoto to Osaka in 2046. Kyushu Shinkansen (Nagasaki Route): a branch line to Nagasaki which partially uses existing regular tracks. Scheduled for completion by spring 2023. Chuo Shinkansen: Using maglev technology, this new line is scheduled to connect Tokyo with Nagoya in 2027 and with Osaka in 2037.